Sarah Derbyshire MBE considers the breadth and possibilities available for a career in music. Choosing to follow a career in the arts has been quite a hot topic recently, not least in response to the Education Minister’s rather doom-laden remarks that choosing to study humanities can restrict career choice. For so many of us in the music and music education profession, this was a heart-sink moment. With an accumulation of academic research findings which demonstrate the positive, lifelong impact a musical education can have on a young person’s development, it was truly depressing to think that such views can still hold sway, and at such a high level in our society. For students considering a career in music, or even wondering if a choice to study music might narrow the options available to them, it’s potentially even more worrying. The advice that they receive at school is crucial. But there are many ways in which the music profession can help, and is increasingly keen to do so. The more contact young people have with music organisations and professional musicians, the more chance of discovering new possibilities and career paths in the industry. First of all, I think we should recognise that the most obvious images of ‘success’ in the music profession can be profoundly off-putting to young people. Traditional approaches to instrumental teaching often hold up the example of a soloist on the concert platform, or membership of a worldclass orchestra, to motivate pupils and emphasise the need for practice. But in a sense, we are setting those pupils up to fail, as the likelihood of their achieving such a goal is remote, if only on the balance of probability. And what if you don’t recognise yourself in such an image? Not everyone wants to be the focal point as a soloist or lead singer on stage. Equally, the life of an orchestral player might be seen as being somewhat anonymous and without its own creativity. A lot of young people will read into the largely mono-cultural faces on the classical concert platform an exclusive club with no place for them. Many are enormously attracted to the buzz and excitement of performance, but don’t see themselves on the stage itself. So it’s important that we find ways to give young people some direct experience of the music industry, and put to bed some of the misconceptions that lead them to discount music as a career option. The opportunities to do this are increasing, not least because Music Education Hubs are now based on a model of partnership between schools, Music Services and music organisations. This is helping to encourage a broader range of opportunities for young people to develop their playing and performance across a wide range of genres – folk, jazz, world, contemporary, as well as classical music. Many organisations offer fantastic workshop and creative projects for schools, delivered by professional musicians. Just working closely with musicians, experiencing new ways of interacting and playing as a group, and creative decision making – can be an eye-opener for young players. It also gives them a chance to find out about the various routes into the profession and how the life of a musician in the 21st century is a lot more varied and multi-faceted than might have been the case, even 20 years ago. Aside from performance-based programmes, there are apprenticeships, paid internships and volunteer opportunities enabling young people to get a taste of the production and business side of the profession. Boards and management of music organisations are beginning to develop youth councils and opportunities to shadow management or curate specific programmes. All this is a sign that the music profession – both subsidised and commercial – recognises that young musicians are the key to a future in which our musical culture genuinely reflects the creative vitality of our society. They are the composers, sound engineers, digital creatives and performers of tomorrow. They are the audiences, the choral singers and amateur orchestral players. They are the teachers who will bring their own love of music to a new generation. To find out how you can take advantage of these opportunities for your pupils, contact your Music Education Hub, or just get in touch with a music organisation in your area whose work you admire. I can guarantee they will be delighted to hear from you and will want to find ways in which they can support your aim to give young musicians the best chance of a fulfilling career in music. Marion Friend MBE, former Director of Junior Trinity talks about her experience of some recent music education outreach work by the National Youth Orchestra of Great Britain. Throughout my career in music education and arts management, I’ve been committed to helping young people reach their potential in whatever career path they choose to take. Since leaving Trinity Laban Conservatoire of Music and Dance where I was Director of Junior Trinity for nearly twelve years, I have continued observing and getting involved in a range of projects and initiatives, and would like to share the experience of a National Youth Orchestra of Great Britain Inspire project with Highbury Grove School in January 2015. Looking for a seat to grab a quick lunch before the start of the Highbury Grove School/NYO Inspire project, I sat down in the school canteen and immediately got into conversation with three NYO violinists. They were friendly, welcoming and enthusiastic about the prospect of working with the combined Year 8 at Highbury Grove during the afternoon. I shared my enjoyment of the recent NYO concert at the Barbican Centre (John Wilson conducting an ambitious Elgar and Respighi programme) and they beamed from ear to ear. These three were personable, intelligent and motivated; this bodes well for the afternoon ahead and my energy levels have already gone up a notch. Into the school hall next where about 200 musicians from Highbury Grove School and NYO are about to rehearse and perform a special arrangement of the John Newman tribute song ‘LoveMe Again’ by a Highbury School member of the music staff Dimitri Scarlato. The soloist is the impressive Jake, a Year 8 student. But how to organise and structure the large forces along with their instrument cases, sheet music, stands, reeds, bows and chatter? This is down to Pierce Brown, Assistant Headteacher and Director of Music, Zoe Martlew professional cellist and NYO coach, and the staff of the NYO Inspire Programme. Zoe kicks off with some communal music games, rhythm patterns and a simple twelve bar blues that she builds effectively within the various orchestral sections. She has infectious energy. I observe NYO players with their antennae out to help with tuning and getting the young Highbury Grove players settled and content; this may be their first orchestral experience. I sense empathy ‘we know how you’re feeling – we’ve been there’. We break into smaller groups and I eavesdrop on a flute and oboe sectional rehearsal. There are about fourteen students here and the NYO players galvanise the group with a ‘pass the note around’ game before getting into the detail of the Love Me Again arrangement. Rhythms are broken down into ‘I do eat cake’ and then the NYO team share music stands with Highbury Grove young musicians, giving a pulse, going over tricky bits and joking, whilst encouraging them ‘ you should be proud; you did great’ when they repeat difficult phrases and have made good progress in a short time. It’s a tricky piece especially for players who have only been learning for a year, so the NYO team are there with sneaky shortcuts ‘just play one note on the beat and leave out all the fast bits’. Sometimes it’s harder to count the bars than to play the notes so they help with that too. I observe some fledgling leadership skills in the NYO team who have a structure and plan, work collaboratively, keep their eye on the clock, and share the highs and lows of wind playing without a whiff of patronising language. What do the NYO flute and oboe team say? This was heartening stuff and there was definitely a sense of consolidation and increased confidence when everyone returned for a full rehearsal and final informal performance. Zoe continued to enthuse ‘If you’ve got lots of notes, be flashy about it!’ The players’ concentration increased as the afternoon progressed, and I found it exhilarating to be there. Catherine Arlidge, Sub-Principal Second Violin of the City of Birmingham Symphony Orchestra, teacher, animateur and winner of the RPS/ABO Salomon Prize gives an overview of her work in music education. My fundamental passion is possibly bigger than the definition of ‘education’ – it is to connect new audiences to classical music. And the way in which I make that connection is by performing with the CBSO in the world’s concert halls, by teaching young instrumentalists and also by finding ways to give new audiences their very first experiences of a live, classical performance. These three types of activity are utterly interconnected and each feeds the others. 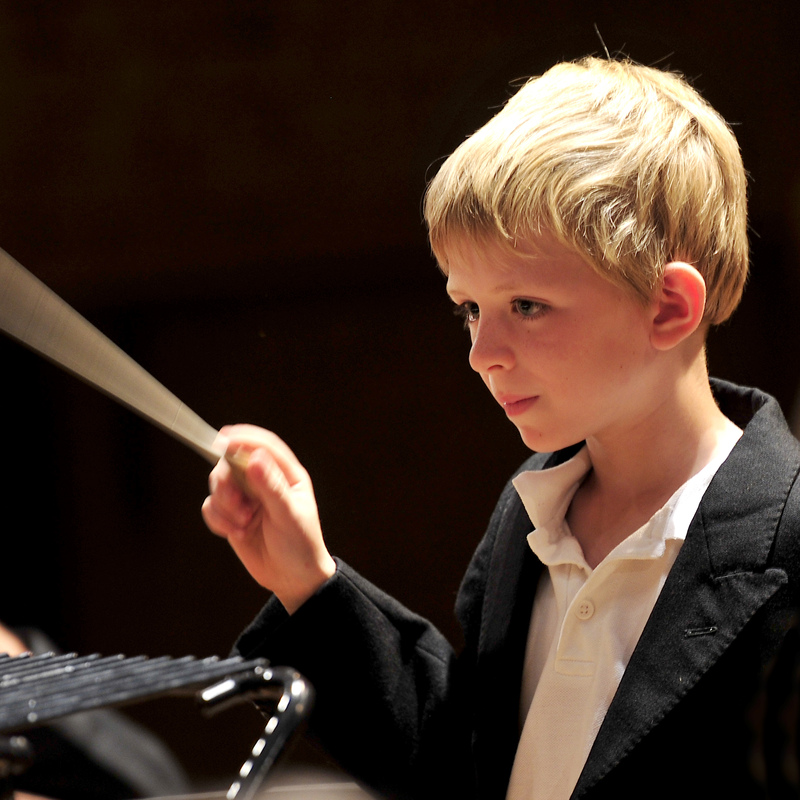 Like every UK orchestra, the CBSO boasts many small ensembles that regularly visit schools. My group is a string quartet ‘The Stringcredibles’ and we have numerous shows and creative hands-on workshops in schools most weeks, most recently connecting to the BBC 10 Pieces. We ‘curate’ our concerts in quite an unusual way – with a clear focus on the meaning behind the music. We always use a visual, digital component and often readings and commentaries, to bring value to the performance beyond our technical and musical skill. Many of our performances focus directly on areas of the National Curriculum both for music but also, as music is such an effective learning tool, we use it to focus on many other areas of the curriculum, beyond music. Possibly our most exciting project to date has been Stringcredibles Apprentices – we recently selected 16 young instrumentalists and trained them to create vibrant, interactive performances for children. Perform – practise your stage presence, your physicality and your speaking, as well as your instruments and ensemble skills. You can have all the technical skill in the world and yet if you communicate nothing it is worthless. We found that by focusing on their ‘musical dialogue’ with the audience, their playing becomes much more characterful, their physicality becomes more engaging, they are less inhibited by the fear of making small mistakes, they allow themselves to enjoy the performances more and this all helps to keep the audience with them. For me Performing, Teaching and Learning are all an intrinsic part of being a musician, and every one of these three disciplines are interlinked. I know I am a better musician for having a breadth of activity as part of my daily life.